For a perfect combination of sturdy wood and tough metal, the Decorative Wood and Metal Pressure Mounted Gate by Summer Infant is where you should look when it comes to safety of your child. This stylish and strapping safety gate would not create any damage on your walls or floors but will, at the same time, definitely safe-keep your child from harm’s way. This safety gate rightfully boasts a combination of materials – wood and metal – that is superior than most other safety gates available in the market, and with its beautiful design, will surely match any décor themes inside your homes. The Summer Infant Decorative Pressure Mounted Gate is easy to install, and as the name suggests, pressure mounted to fit around any opening around your house. This includes mounting the gate at the top of the stairs or any such high-risk places because even the most active child cannot budge this gate no matter how much they try. 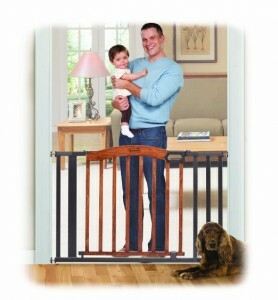 For a sturdy grip, many parents prefer this particular safety gate for their children. This gate has an easy operation and it is possible to open the gate with one hand, while holding the child or any other heavy load with the other hand. However, what is easy for the adults is not so easy for the children, because no child would be able to open the lock and step out of their safety zones. The Summer Infant Pressure Mounted Gate fits into an opening extending from 32 inches to 60 inches, as well as 32 inches in height. This wide option for extensions makes it easier for the gate to be used in smaller openings like doorways, or in wider openings such as corridors and backyards. The gate is originally 32 inches, and can be extended up to 60 inches with three additional extensions – 4 inches, 7 inches and 11 inches in total. This gate is a slate metal and oak finish, and is sturdy enough for parents to trust around their children. The metal gate swings both ways which makes it easier for adults to move around, without any problem or delay. Although the gate is pressure mounted, this particular model comes with screws that can be used to screw the gate into walls, especially if the gate is put near dangerous areas of the house, i.e. stairs and kitchen doors. Since the gate is made of metal, the latch on the lock is prone to make noise, which can sometimes be a problem especially if there’s a sleeping child involved. Also, metal means there is always a chance of rusting, which again, contributes to the noise. Besides, a pressure mounted gate means that there can be some damage to the colors of the wall when the gate is installed between them with pressure. However, a little color chip is preferable to many instead of drilling the gate into the walls, as is necessary with many other gates. The Summer Infant Decorative Wood and Metal Pressure Mounted Gate is rated 4.5 out of 5 stars.